In the days before the Flood, Azaziel had been a Watcher, sent down to help God's creatures on Earth. He fell in love with one of Cain's granddaughters and they passed her mortal life in bliss. Now he's imprisoned in the Los Angeles basin. His angelic brethren, Heaven's misfits, don't understand the longing Aza feels: once he had been loved entirely for himself. The succubus Lorelei doesn't know any of this when she sets her sights on Azaziel. All she knows is that the angel's fall will bring glory to Hell and acclaim to any succubus who accomplishes it. Of course, it never occurs to Lorelei that Azaziel might try to tame her by possessing her with a mortal girl's soul. 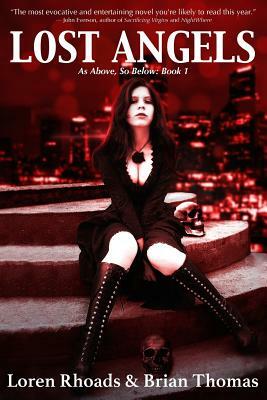 Can the succubus find an exorcist before the fury of Hell is unleashed? Loren Rhoads is the author of The Dangerous Type, Kill By Numbers, and No More Heroes, the books of the In the Wake of the Templars trilogy. Her Lorelei stories have appeared in the books Sins of the Sirens and Demon Lovers. Keep an eye on her at LorenRhoads.com. Brian Thomas served a decade-long stint as a researcher at 20th Century Fox, specializing in religion, arcana, death, and creative violence. He contributed his expertise in matters celestial/ infernal to such projects as The X-Files, Millennium, Buffy the Vampire Slayer, Angel, The Order, and The Omen. Brian also contributed to Morbid Curiosity magazine, Jamie Foxx's Night Tales website, and many uncredited script-doctoring assignments. He currently operates Rogue Research, a freelance research service for filmmakers, authors, and artists.